Thanks so much for the clarification , can you tell me if BM Inukshuk is a greige or a Taupe. The floors in this house we are going to be living in have a lot of yellow and red in them. It’s a laminate of some form. I was going to paint Inukshuk to tone them down. Hi Lena, sorry for the delayed reply! I would call Inukshuk a taupe for sure! Hi Linda, a lot depends on the paint colour and the room – so I can’t say for sure…generally a reasonably well-lit room with a lighter colour can work well. Thank you for your input! Now I’m thinking possibly repose gray…what do you think? Hi Eileen! 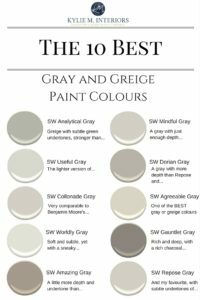 If a colour has some gray in it, then it’s very likely it will pick up typical gray undertones. However, you do lose blue once you add beige. My best bet would be BM Edgecomb Gray, but a lot of it depends on your home and it’s exposure/needs. 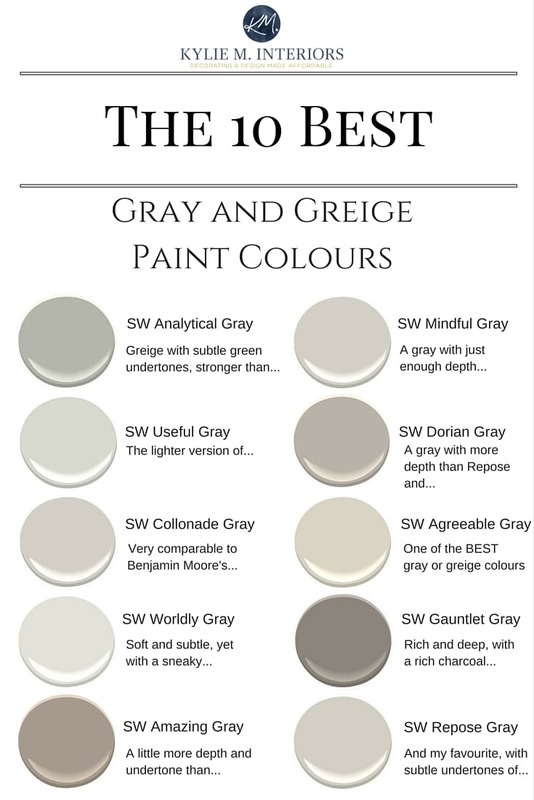 You can also look at SW Agreeable Gray! In your You Tube video on “Agreeable Grey” ( https://www.youtube.com/watch?v=WpOIKxjQEyw ) you showed a color swatch of a “clean sharp white” to go with the “Agreeable Grey”. What was the color of that white? Hi Catherine, that is TOO funny, I’m actually JUST writing a blog post about this exact thing – the most WHITE white. That there is actually SW off-the-shelf white – no tint. I did have them add a few drops of white tint though so that I would get some coverage as ‘white’ itself doesn’t cover very well. The next most white white would be SW Extra White, but I find it just a flash too stark. trying to find a paint color our basement is in beige, navy blue , wood is redish brown (mission style) and carpet is browns and cream. Would like to do a Gray brown color on walls but not to dark because it doesn’t have alot of natural light there is a deck over large window. Can you make a suggestion. We are building a narrow bungalow type house and trying to come up with an exterior color scheme, any suggestions? Thinking we should stay away from dark colors as the house is only 32’ wide and don’t want to make it seem even smaller???? Hi Divya, check out SW Big Chill for a soft light, slightly cool look! Do you have a recommendation for a gray wall color the blends well with brown leather? If so, what color ceiling in gray would complement wall color? Thanks…. Hello! You have inspired me and I purchased SW Useful Grey and have been painting for several days now! Generally speaking, will most of the colors that are in the ‘Natural Wonder’ SW Collection – such as Grey Screen and Rare Grey go well as an accent wall or to paint some accent pieces – such as a small table…etc.? I truly believe I am color blind and have no ability to determine what colors flow well 🙂 Thank you! Dear Kylie, I have oak floors, a light oak kitchen cabinets, and a very light oak coloured furniture….yes, lots of oak. I am looking at painting the walls with SW Collonade grey. Would you think that this combination would work, if I had to accessorize with white, brushed nickel lamps ? If not, I have my current accessories in gold tones, would that be okay to use ? Hi Lorraine! Off the top of my head it SOUNDS like it could work, but without photos, i can’t say for sure. The only way to say for sure is with my E-design, but really, I can say that ‘generally’ it should work! Hi Lois, thank you for your note! I actually have an Edesign business that I’ve created for questions like yours! I try to give as much complimentary info as I can on my blog posts and if that doesn’t work, it might be time for a closer look, this way I can see your furnishings, flooring, etc…otherwise I’m totally guessing! Dear Kylie: Boy, am I confused. . I am a retired travel writer and photographer. After clearing out my home office of filing cabinets and other business-related items, I thought a fresh coat of paint would be the ticket, and wanting something modern, I decided on gray. Little did I realize I would be dealing with such an abundance of gray, griege, and beige. It’s the variables that have me stumped, and I beg your intervention. The variables: southwest-facing room, terra cotta tiles, small but contained space. My home is Albuquerque, and it has a definite Southwest flair. Will the terra cotta tiles affect the wall colors, and how do I pick a gray that will complement, not clash with that? Your assistance would be much appreciated. Hi Sally, thanks for your note! Yes, those terra cotta tiles can be tricky! I’ve found that grays with a subtle blue or warm purple undertone can sit nicer than grays with a green undertone. I also wouldn’t go TOO greige/warm and would stick more to the warm grays. I love your post. I’m going to be putting my townhouse up for sale soon and want a nice neutral greige to paint the walls. Not too dark or too light. Is there a nice neutral color I can use? Lots of light and there’s a slight green tint to the windows and lots of green outside. Hi Pat, take a look at Edgecomb Gray, it’s pretty darned versatile! Just keep in mind that I haven’t seen your home/finishes/lighting, so it’s a very light suggestion! I love your website, blog, hilarious comments- the whole package! Thank you for being so inspiring. For the exterior of our “transitional” style house I’m loving the idea of BM Revere Pewter siding, BM Wythe Blue shutters (only have 6 shutters) and BM Simply White trim (to match the new window sashes). And thinking of painting the large 2-car garage door Revere Pewter rather than trim color. How do you like this combo? Hi. Just found your site and really appreciate your advice and skill. I have A LOT of medium oak cabinetry, trim and furniture. Which of the lighter grey or greige colors have blue undertones? THANK YOU! I have been ruminating over this for years! BM Gray Owl / SW Big Chill / SW Silverplate / BM Stonington Gray and even SW Agreeable Gray. It’s a greige, but it quite often goes blue-gray! C an you recommend a greige that has no undertones of blue or purple? I’m looking at agreeable gray. Undertones of green are ok. I did poised taupe in my bedroom, and love it, but until the furniture went in, It had a very strong undertone of purple! Im looking for a true greige. I’m trying to find a fairly light gray that looks gray. Not neigh or blue or green. Can you recommend some colors?